28. Anne–Sophie Pic- OK, Le Fooding is more au courant than the stuffy old Michelin Guide, but that three–star award still means something. And Pic was the first woman to win it—in 50 years at her century–old family restaurant, La Maison Pic. She's French. Her father was a chef. Her grandfather was a chef. Growing up, her bedroom was situated over the kitchen of her family's restaurant. So of course Anne-Sophie did what any normal teenager would do. She rebelled. She rebelled against the family business of being in the kitchen. She did (what I consider to be) a complete one-eighty by going overseas to study "management". Fortunately, at 23 the pull of the kitchen led her back and she decided to train under her father. Sadly, he passed away not long after she made her decision. But she kept on...and she shook up the restaurant by changing the menu to "reflect her devotion to plain, natural ingredients". * Can't you just hear the French curses flying!? Whisk together the eggs and the sugar. Scrape the seeds from the vanilla bean and whisk them and the milk into the eggs. Place a skillet over medium heat. Dip each slice of Brioche into the custardy mixture and flip. Let sit to soak for about five minutes. Add a pat of butter to the hot skillet and once it melts, lay on the soaked bread. Cook for a few minutes, or until golden. Flip and repeat. Repeat with remaining slices. Looks fantastic. We do love french toast in this house. If you follow my recipe blog, you know I have serious issues with recipe names like pain perdue. French toast is french toast...lol, a fancy name doesn't make it taste any better. OK, I'm off my soapbox...that first picture is a REAL winner, looks absolutely delicious!!! Your write-ups of these women game changers are always pithy and funny Heather...I CAN hear the curses flying! 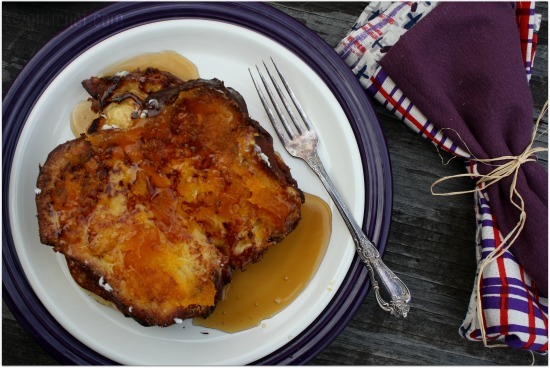 The French Toast looks amazing with vanilla bean and nutmeg, I think I'm going to make this for Christmas breakfast--- my family thanks you in advance. You did a great job BBFF. This is such a comforting dish! Love the inclusion of vanilla bean! I always do cinnamon, but this makes me excited! I also always thought pain perdu was stuffed french toast so it's interesting to learn it's french toast plain and perfect! With the use of whole milk and brioche, this is probably much richer than the french toast we're used to around here -- think skim milk and water challah. Gorgeous photo at the top! Sounds like a nice holiday brunch item. Nothing more delicious than pain perdu made with brioche, Heather! So rich. And perfect for the holidays! It's funny that the French call it Pan Perdu and we call it French Bread. I'm sure this must taste absolutely wonderful. Love your pictures! 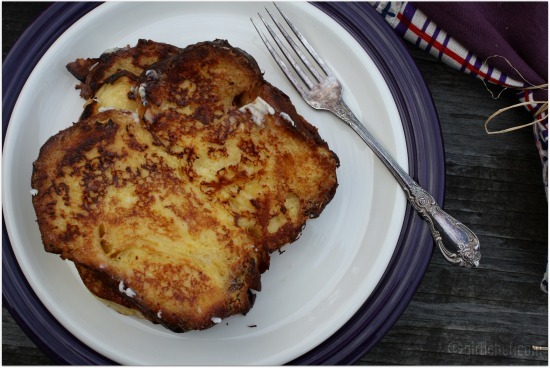 I like French toast - simple to make and tastes great. I love the seasonal touch with the pumpkin jam! 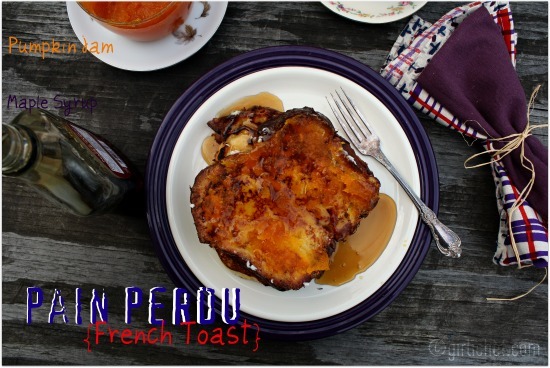 French toast ... a lowly use of bread that makes for a spectacularly fantastic eating experience! Bravo! Husband insists on French Toast every Christmas morning (I grew up with Eggs Benedict, sigh). This is the perfect breakfast for us - so will be doing it. Love your take on Anne-Sophie - the rebellious chef! This puts my normal boring french toast to shame. I love French toast make with Brioche. Tried it with Panettone, too. Delicious! I think I'll have it tomorrow. Merci! Yeah, 4 FAT slices of brioche, that's what I'm talking about! This looks like what I should eat this weekend, wait not should, will!! I love that you post so many wonderful breakfast recipes. Watch out though. One day I might wind up on your doorstep in my pajamas. Growing up around all that food, you know she HAD to become a pretty good cook. Nothing like waking up to some delicious french toast for breakfast. And with brioche...you can't lose.